Air France is the first European carrier to introduce the Airbus A380 double-decker Superjumbo in its fleet, with the first scheduled commercial flight taking place between Paris Charles-de-Gaulle and New York JFK airports. Air France has 12 of the type on order and plans to take delivery of the first three in the 2009/2010 winter season. Their first plane is already the 20th of the type in operation and now all three airline alliances operate at least one of the type. 380 tickets for each of the first flights were auctioned off on e-Bay in October, where all proceeds went to charity organizations selected by Air France. The first European owned SuperJumbo seats 538 passengers – compared to just 450 at Qantas, 471 at Singapore Airlines and 489 at Emirates. The so-far most crowded A380 has only 9 seats in First Class, 80 in Business and 449 in Economy. 22 flight attendants will be taking care of the 538 passengers – meaning one steward(ess) for every 25 travellers. Besides being the first European airline to own the A380, Air France will also be the first to operate the aircraft to the African Continent as it plans to introduce the plane to a daily Johannesburg flight later this winter following the Paris-New York route. At the launch ceremony Air France CEO Pierre-Henri Gourgeon did not only focus on the “usual” media messaging around the unrivaled luxury of the A380 (as Singapore Airlines, Emirates and Qantas did earlier), but instead pointed out the savings that this aircraft will bring for the company. Each aircraft will allow the carrier to save €12-€15 million ($17.7-$22.1 million) per year based on their calculations. This is mostly due to the size of the plane and that it can replace two other flights, which could be serviced by an Airbus A340-300 (equivalent to the upper deck) and a Boeing 777-200 (equivalent to the main deck of the A380) for example. Flying the same number of passengers in just a single A380 instead means 20% reduction in operating costs as the frequencies on busy routes can be rationalized by replacing two flights which leave at similar times by one flight, while offering the same number of seats. For example, between Paris and New York, an A380 leaving at 1:35pm can replace two flights operated by an A340 and a 777-200, leaving at 10:30am and at 1:35pm respectively. The same connecting morning flights can still service and feed the “big” flight. On top of all the rationalization of flights, the A380 uses less fuel per passenger. It burns less than three litres per 100 km! Besides the gas emmissions, the A380 creates less noise than its closest rival, the Boeing 747 – half as much at take-off! I had the personal experience of seeing and (not) hearing the A380 land in Frankfurt on one of its test-flights back in 2007 with Lufthansa crew – and we were all shocked by the little noise it generated compared to other aircraft landing on the same approach route before and after it. 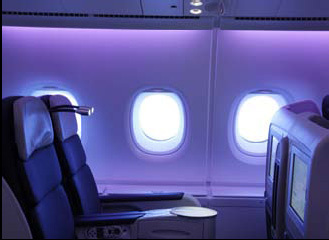 The Air France A380 is also quieter in the cabin itself, and besides the 220 windows it has special lighting features to reflect the time of the day within a flight and to help synchronizing the body-clock of the passengers. Guests can also meet up during the flight for a drink and a snack in one of the 6 bars onboard. 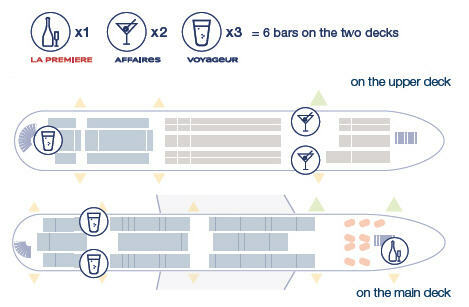 One of these is for Première (First Class) on the main deck, two for Affaires (Business Class) on the upper deck and three for Voyageur (Economy Class), with two at the main deck and one upstairs. We hope Air France and its passengers will be happy with the first new Airbus A380 flying under European registration and providing the first Transatlantic connection aboard the double-decker superjumbo between Europe and North America. Please leave your comments if you happened to be on one of these flights and would like to share your experiences with our readers! Separately, but conincidentally at the same time as the first Air France A380 flight: Emirates said it will begin serving Paris Charles de Gaulle with a 489-seat A380 from Dubai on Dec. 29 rather than Feb. 1. “An operational review, coupled with demand on the route, has led to an earlier introduction,” it said. The A380 will fly thrice-weekly to start, becoming daily Jan. 17. With 19 Airbus A380s already in service around the world, it’s time to take a look at the latest Airbus A380 news – following our latest updates about new flights and operational issues. The launch customer of the Airbus A380 superjumbo – since October 2007 – has already received 9 of the type and has brought the A380 to 7 cities so far. More than 1.4 million customers have flown on its A380s that have clocked more than 35,000 flying hours on more than 4,000 flights since the start of commercial service. Following the first flight to Hong Kong in early July, Melbourne in Australia will be the latest airport to receive the A380 service with 471 seats on board in three classes, following Singapore, Sydney, London, Tokyo, Paris and Hong Kong – when the first flight will land in the second most popolous Australian city on 29 September, 2009. The daily A380 flights will replace an existing daily Boeing 747-400 service to Melbourne. SQ227 will depart Singapore Changi Airport at 2100hrs and arrive in Melbourne at 0610hrs (0710hrs from 4 October 2009 due to daylight savings) the next day. On the return leg, SQ228 will depart Melbourne at 1550hrs (1650hrs from 4 October 2009) and touch down in Singapore at 2140hrs. Emirates currently has the largest order placed for the doubledecker aircraft and has already received 6 of the type. Starting in July 2008, Emirates have been serving London Heathrow, Sydney, and Auckland. Since the 1st of June they have been operating the A380 to the Thai capital of Bangkok on a daily flight and to Toronto in Canada, three times weekly. The next Asian destination for the Emirates A380 will be the Korean capital, Seoul, from the 1st of December. The 489 seat, 3 class configuration Emirates A380 features two fully equipped bathrooms with showers and an onboard bar for first and business class passengers as a specialty. In Europe, the next airport served will be Paris Charles de Gaulle from 1st of February, 2010. But Emirates will operate a single service to UK’s Birmingham to mark the Airport’s 70th birthday on September 9th, 2009. This will be the first commercial A380 service outside of London Heathrow in the UK and will park at the new Pier of Birmingham Airport – which opens on the same day with the Emirates A380 as the first aircraft being served there. Qantas has been operating the A380 is its fleet since October 2008. The fourth A380 arrives to Australia at the end of July, allowing Qantas to increase its Sydney-Singapore-London A380 services from three to five per week, and Sydney-Los Angeles services from three to four per week. The fifth and sixth airplane scheduled to arrive in 2009 will further increase the frequency between Australia and the UK and the US, as by November Qantas will operate daily A380 services to London and LA and will increase the Melbourne-Los Angeles services from two to three A380 flights per week. By the end of 2009 this will mean 34 return flights per week. The 450 seat, four-class configuration aircraft type has so far transported more than 200.000 passengers at the Australian flag-carrier. Air France – the first European operator of the type – has rolled out the airplane in its new livery on the 9th of July. This airplane is scheduled to enter service in November on a daily Paris Charles de Gaulle – New York JFK service. It is interesting that Emirates had operated the A380 to New York JFK before, but has since withdrawn the aircraft from the route. The French A380 will be configured for 538 passengers in a three-cabin layout with 80 business and 106 economy seats on the upper deck and nine first class and 343 economy seats on the main deck. That compares with 450 seats on Qantas A380s, 471 on Singapore Airlines and 489 on Emirates. CEO Pierre-Henri Gourgeon said in a recent conversation in Paris to Airwise News that Air France’s A380s would not be equipped with special luxury features specifically designed for the double-deck aircraft like spas or spacious premium suites. “It’s an aircraft, an aircraft offering high-density seating and thus offering lower unit costs,” he said. “We will use it as such.” AirFrance will be the first European airline to operate the A380 and the first to use it on transatlantic flights between Europe and the US. It has 12 on order, four of which will start operating this winter and next spring. It has been confirmed by Air France that their flight AF 447, linking Rio de Janeiro with Paris (Charles de Gaulle) had disappeared earlier today from the Brazilian radars and has never contacted Senegalese air traffic control. The Airbus A330 should have landed in Paris at 11:10 local time but it has dissappeared earlier this morning. The plane – with 216 passengers (126 men, 82 women, 7 children and a baby) and 12 crew members onboard – took off from Rio de Janeiro Sunday evening at 7pm local time, heading towards Europe on a route that would lead northwards above Brazil, then crossing the Atlantic towards Senegal and flying through Spanish air-space before arriving to the French capital. However, contact with the aircraft was lost about 3 and a half hours into the flight (~1:33 GMT), when the plane was cruising at 35.000 feet at a speed of 840 km/h, approximately 300 kms from the Brazilian shore (565 kms north-east of the Brazilian city of Natal), above the Atlantic Ocean – already outside of Brazilian radar-space. It had last contacted air traffic control in Recife, Brazil. Brazilian Air Force started the search early Monday morning around the Northeastern Brazilian island of Fernando de Noronha (365 kms from the South-American coast). They were later joined by a French military plane flying out of Senegal to help with the search. Brazilian officials cautioned that the search area could be three times the size of Europe. See map on CNN.com and the map on BBC.co.uk. There were several possible scenarios why contact was lost, it could have been a transponder problem, a hijack or a crash. Transport analyst Kieran Daly told CNN that the lack of communication with the aircraft “does suggest it was something serious and catastrophic.” He said the aircraft involved was one delivered to Air France in April 2005. Given the fact that that Airbus A330 is one of the safest airplane types currently flying around the Globe – not having a regular fatal accident since its first commercial flight in 1998 -, theoretically it could have done a water landing – similar to the US Airways flight that ditched in the Hudson river earlier this year – but the fact that all radio contact had been lost does not sound too positive at this stage. Also in the middle of a storm at the open ocean it is a much harder task than the Hudson river in quite weather. The plane was hit by heavy turbulance in stormy weather and reported electrical problems before it lost contact, Air France said Monday. The automatic system of the Airbus A330-200 began a four-minute exchange of messages to the company’s maintenance computers, indicating that “several pieces of aircraft equipment were at fault or had broken down,” at 02:14 GMT (four hours after leaving Rio de Janeiro) as it hit strong turbulence early in its 11-hour flight from Rio de Janeiro to Charles de Gaulle airport in Paris, Air France CEO Pierre-Henri Gourgeon told a news conference. “This succession of messages signals a totally unforeseeable, great difficulty,” he said. “Something quite new within the plane.” During that time, there was no contact with the crew, Gourgeon said, adding that “It was probable that it was a little bit after those messages that the impact of the plane took place in the Atlantic,” he added. He also said that flight AF 447 was probably closer to Brazil than to Africa when it crashed. Speculations are now pointing towards a possible lightning strike as the cause of the electrical malfunction – but that alone should not have brought down a modern airliner such as the Airbus A330. The jet had also sent a warning that it had lost pressure, the Brazilian air force said. The missing jet, registered as F-GZCP last had a maintenance check on April 16 and has been flying in service since April 18, 2005 – with 18870 recorded flight hours and was powered by General Electric CF6-80E engines. According to Reuters, two Lufthansa planes have flown over the same area shortly before and shortly after the Air France flight – without any incidents. Both German pilots reported the bad, stormy weather. The chances of finding any survivors were “very low,” French President Nicolas Sarkozy admitted Monday. Air France identified the nationalities of the victims (based on the information received from the Brazilian Authorities) as two Americans, an Argentinean, an Austrian, a Belgian, 58 Brazilians, five British, a Canadian, nine Chinese, a Croatian, a Dane, a Dutch, an Estonian, a Filipino, 61 French, a Gambian, 26 Germans, four Hungarians, three Irish, one Icelandic, nine Italians, five Lebanese, two Moroccans, three Norwegians, two Polish, one Romanian, one Russian, three Slovakian, one South African, two Spanish, one Swedish, six Swiss and one Turk. This means 32 countries are involved in the tragedy. The four Hungarians are said to be 2 adults and 2 children. A woman returning from a 3 week training in Brazil – that she held on behalf of the International Pető Institute – with her spouse and her child – traveling together with another child who had visited relatives in Brazil. According to Brazilian sources, Luis Roberto Anastáci, President of Michelin South America was also among the passengers. Two ticket holders were not allowed to get on board due to the expiration of their passports. Update (02/June, 20.00 CET): some debris of a plane were found by rescue teams. According to new sources a seat, a life vast, an oil drum and signs of oil and kerosene were found, but there were not enough material to make sure these were parts of the lost plane. Three commercial ships were directed to the area later in the afternoon. Update (07/June, 10.00 CET): According to CNN, two bodies and some parts of the aircraft were found yesterday. Also a backpack and a leather briefcase were found, the latter holding a flight ticket, which was identified by Air France and it was proven to belong to one of the passengers. Airbus said the automated error messages may show that the speed controls were faulty. Read more here. The French national carrier, Air France has launched a new, updated logo this week, that will eventually be used in all of their communication materials as well as on their full fleet of aircraft. The company also said that the rebranding will be gradual in order “to avoid additional costs“. The AirFrance website already features the new logo. The new logo shows the airline’s name written as one word in navy blue, with light and elegant typography with a read flourish to the right. The last logo change happened in 1975, this new logo tends to represent a global carrier that has more than 50% non-French passengers. The version with the SkyTeam logo follows the same path as before, simply placing the SkyTeam logo on the right side of the carrier’s own. In case of an airline logo change, one of the most important questions is how it will translate to aircraft liveries? In this case it will be very simple, the fleet will gradually get the new design with the regular paint jobs, and the only two things changing will be the carrier’s logo in the front, and a very minor change to the tail: Turning the old 5 simple lines to only 4, flourish type of lines as seen here below. You can see a video explaining the change at the Air France Corporate website. Following earlier indications by British Airways, who are joining a consortium to bid for Spanish Flag-carrier Iberia, Air France-KLM has yesterday admitted that they are preparing to launch a bid for Iberia together with several Spanish companies, Madrid’s Expansion newspaper reported. The consortium likely would include investment firm Torreal and publishing house Grupo Planeta, which currently is the largest shareholder in Vueling Airlines (a Spanish low-cost). The AF KLM offer would keep 51% of Iberia in Spanish hands, allowing it to maintain its traffic rights for non-EU and US routes. In recent weeks, as Airlineworld has reported as well, AF KLM Chairman and CEO Jean-Cyril Spinetta has stated several times that the group is “studying” the Iberia dossier, while admitting that they will be open to Alitalia as well, would the Italians decide to talk to them. British Airways is also planning a potential merger with Iberia though a consortium which would also probably leave 51% in Spanish ownership for the same reasons (flight rights) as AF-KLM. Air France KLM has once again admitted their interest in Iberia and Alitalia, which airlines are basically on sale. Iberia, the Spanish national carrier is profitable, but the shareholders wish to find a new owner to protect the company in the long run, while Alitalia has been making losses for long decades by now, and the government is forced to sell it, basically under any circumstances. Air France KLM wants to grow, and now emphasizes it once again. They are already the biggest European carrier, but they want to move forward and wish to become a major driving force behind the ongoing consolidation of the European Airline Market. He explained that AF KLM declined to participate in the failed auction earlier this year for the Italian government’s stake in Alitalia because it did not believe the terms and conditions set for the sale were viable. But the situation has changed with the appointment of a management team led by Maurizio Prato, who initiated a new restructuring effort, which includes cutting back traffic at Milan-Malpensa hub, and has been asked by the government to sell the state’s 49.9% stake, he said. “If Mr. Prato wants to talk to us, we will listen carefully,” Spinetta said. “He has a clear mission to sell this stake, but how he sees this problem I don’t know.” He added that “the Italian market is very strong. There are huge business traffic flows and tourist leisure flows. The potential is very high.” And knowing that both airlines being members of SkyTeam, the traffic integration would not be that big of an issue in this case, but the financial situation is the one that would easily give a headache to AF KLM. Now, that several privatization attempts have failed for Alitalia, AF KLM may be in a better (and stronger) position to discuss a possible solution face-to-face with Alitalia, and Mr. Prato.